(NEW!) 2. A 28-year old woman is evaluated for an 8-month history of a non-pruritic, painless indurated plaques on her back and lower abdomen. On further inquiry about this rash she denies any association with sun-exposure or other environmental triggers nor she has identified any palliative or provocative factors. There is no history of reflux disease, no shortness of breath with exertion nor any history of Raynaud phenomenon. Her past medical history is unremarkable and she only takes oral contraceptive medications. On physical examination her vitals are stable and normal. On her back there is a 4× 5-cm and on lower abdomen 3 x 8-cm areas of induration where the skin is quite smooth with some associated blanchable-erythema. Examination of her nail beds show no evidence of capillary loop dropout nor any other skin lesions are noted. Her laboratory tests including an ANA was negative. A skin biopsy was done on the first visit and the results return two weeks later showing an increased number of lymphocytes in the dermis with a perivascular predominance in keeping with sclerodema. 2. B- This is a case of limited morphea. Morphea is a type of sclerosis that involves the skin without other extra-cutaneous or systemic manifestations which is different from the cases of systemic sclerosis. Additionally, as this patient’s biopsy confirmed, morphea has the same histologic appearance with systemic sclerosis. Additionally, morphea can be divided into two (2) distinct categories: a limited variant and a diffuse variant. 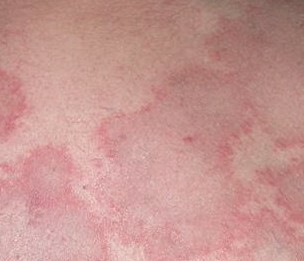 This is a case of a limited variant, in cases of diffuse morphea there tends to be involvement of the torso and limbs. Read more about systemic sclerosis here on Medscape.